We held a contest on our Facebook page asking people to choose an ingredient for us to cook with this week. Eggplant was the most popular nominee, getting the most votes! Since we are always trying to eat more vegetables and encouraging others to do the same, this winner puts a smile on my face and in my heart. Native to India, this vegetable (which is really a fruit) is not only rich in color, but loaded with vitamins and minerals and many health benefits. 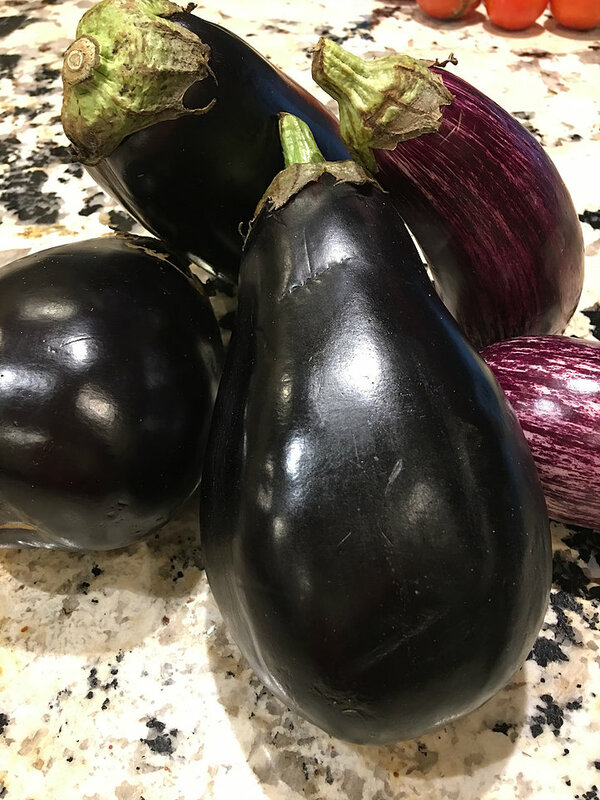 The eggplant is a good source of vitamin C, vitamin K, B1, B6, and B3, potassium, copper, iron, manganese, and folic acid. It is also an excellent source of dietary fiber, which aids in digestion, is good for cardiovascular health, helps reduce cholesterol, and improves gut health. Wow! The phytonutrients in eggplant also boost cognitive activity and help protect our brains from toxins and disease. Because eggplant soaks up so much oil when fried, we chose to bake it on a greased cookie sheet instead. 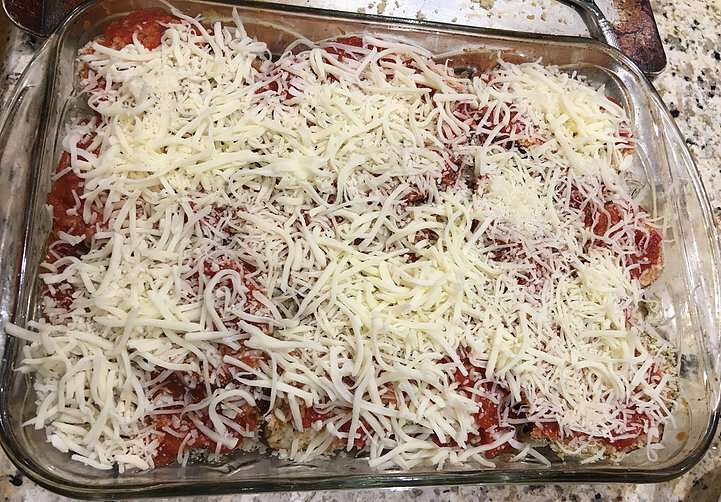 Love all the layers of breaded eggplant slices, tomato sauce and three cheeses. 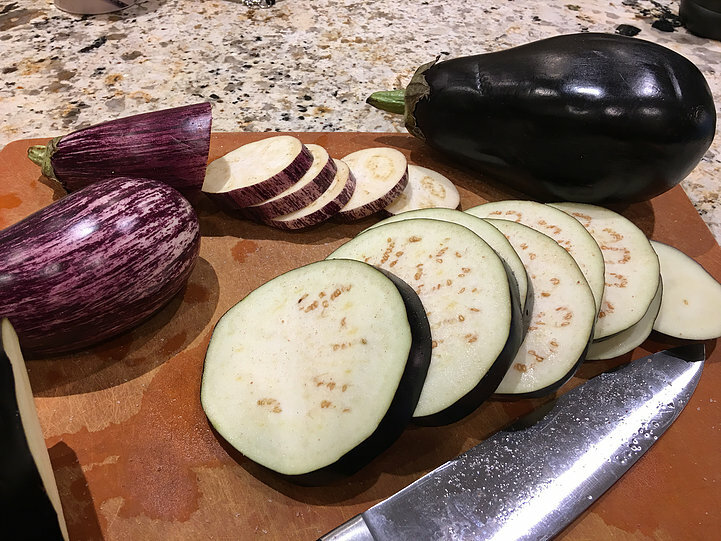 Slice eggplants into 1/4" thick rounds. Sprinkle with salt and set aside for 1 hour. Rinse. Spray 2 baking sheets with cooking oil. Spread bread crumbs on a large plate. Mix in oregano, salt, and pepper. 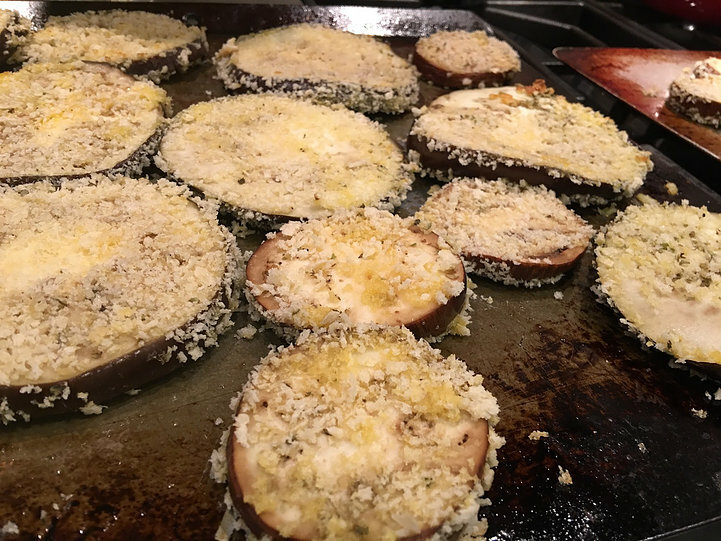 Dip eggplant slices, one at a time, into beaten eggs and then press both sides into bread crumbs. Place on baking sheet. Bake in the oven at 375 for 10 min. Turn eggplant slices over and bake for 10 min. more. Remove eggplant from the oven. Using a large casserole dish (9" x 12"), spoon enough tomato sauce to cover the bottom of the casserole dish. Make a layer of eggplant slices over the sauce. 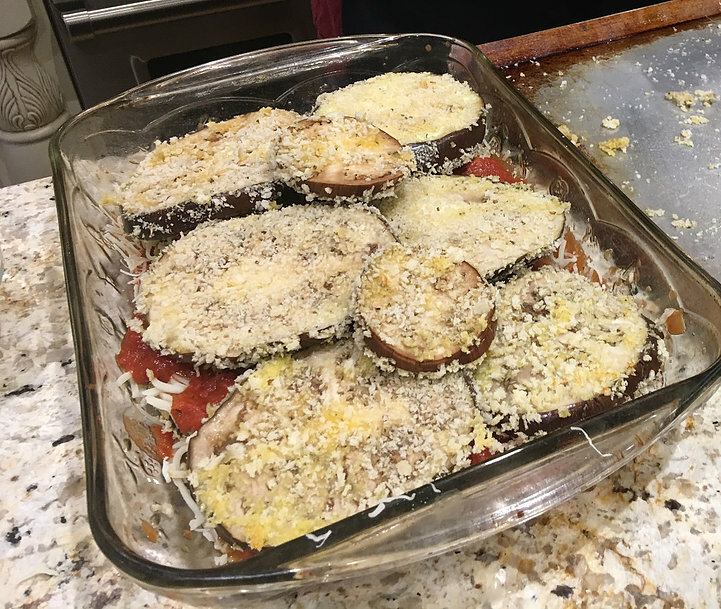 Sprinkle 1/3 of mozzarella, provolone, and parmesan cheeses over the eggplant slices. Repeat with 2 more layers ending with the cheese on top. Place casserole on the top rack in the oven and bake at 375 for 40 minutes.